Topics: Offers, Used, Servicing, Used Cars, and New Car Offers. volkswagen-colchester... Volkswagen Colchester. 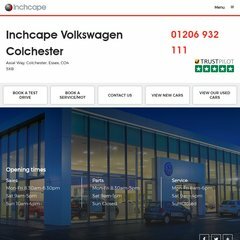 Used Volkswagens Dealer Colchester ..
On average 6.00 pages are viewed each, by the estimated 91 daily visitors. It is hosted by Psu Technology Group Ltd (England, Gloucester,) using Microsoft-IIS/7 web server. There are 2 Nameservers, ns.123-reg.co.uk, and ns2.123-reg.co.uk. The programming language environment is ASP.NET.